I read this article and found it very interesting, thought it might be something for you. The article is called 3 Million Truckloads Daily: India’s Real Trash Problem and is located at https://archive.indiaspend.com/cover-story/3-million-truckloads-daily-indias-real-trash-problem-68539. Prime Minister Narendra Modi may want a “Swachh Bharat” (clean India) by 2019, but sweeping the streets does not address the enormity of India’s real garbage challenge. As prosperity grows, 62 million tonnes of garbage is generated everyday by the 377 million people living in urban India, now the world’s third-largest garbage generator. However, it’s not the amount of waste generated that’s as much of an issue as the fact that more than 45 million tonnes, or 3 million trucks worth, of garbage is untreated and disposed of by municipal authorities everyday in an unhygienic manner leading to health issues and environmental degradation. These 3 million trucks, if laid end to end, would cover half the distance between the earth and the moon. Or to put it another way, that’s the distance you would cover if you made 15 trips between Mumbai and Los Angeles. With rapid urbanisation, industrialisation and an explosion in population in India, solid waste management will be a key challenge for state governments and local municipal bodies in the 21st century. The “Swachh Bharat Abhiyan” (Clean India Mission) was created to tackle these very issues related to waste management, cleanliness and sanitation on a national level. The campaign was launched on 2nd October 2014, on the occasion of Mahatma Gandhi’s birth anniversary and is expected to be completed by 2019, on Gandhiji’s 150th birth anniversary. Through this initiative the government of India aims at the complete collection and scientific processing, disposal, reuse/recycle of garbage, officially called municipal solid waste, for all 4041 statutory towns in the country. The total cost of the mission is estimated at Rs 62,009 crore out of which the central government will contribute Rs 14,623 crore. As per a 2013 report from the International Solid Waste Association (ISWA), the total garbage generation in 2013 was 1.84 billion tonnes per year around the world. The countries creating the highest amounts of waste were China, followed by the United States and India. OECD countries produce almost half of the world’s garbage, while Africa and South Asia regions produced the least. A person creates waste of around 3 times their own weight, which means that on average 271.7 kg of garbage per person was generated in 2013. 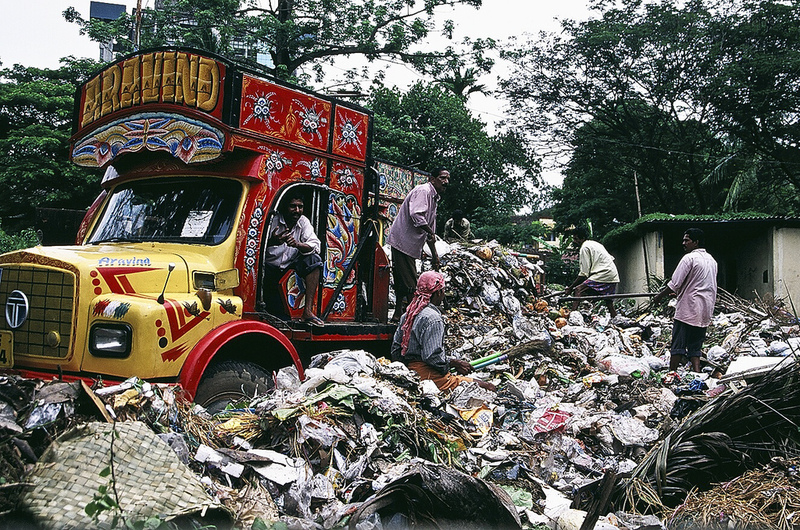 Of the 122 countries that we have figures for, 73.9 per cent of garbage generated is collected. Low-income countries have low collection rates of around 41% while high-income countries have higher collection rates averaging 98%. Similarly, a lot of garbage and waste is found littered on streets and corners of Indian cities and towns. Dumping of waste leads to blockage of drains causing floods, contamination of water and air pollution, leading to the spread of diseases around the area.The Government of Maharashtra even banned the production, sale and use of plastic bags in 2005, in response to annual flooding in Mumbai. Source: PIB; *TPD – Tonnes Per Day. The data above has been collected by the Central Pollution Control Board through State Pollution Control Boards and Pollution Control Committees on quantity of garbage generation, collection and treatment. A total of 1,33,760 tonnes per day (TPD) of garbage was generated in all states and union territories of India, amongst which Uttar Pradesh tops the list with 19180 TPD of waste followed by Maharashtra (17000) and Tamil Nadu (14532). Of the total waste generated, only 91152 TPD was collected and only than 25884 TPD was treated. The small state of Sikkim generates only 40 TDP of waste of which 25 TDP is collected and treated. Only 68% of the garbage generated in the country is collected, of which 28% is treated by the municipal authorities. Thus, the poor collection and treatment of waste leads to dumped garbage on streets clearly showing up the poor and inefficient system available to tackle waste management in urban areas. If this issue is not tackled efficiently and better policies and practices for waste management are not adopted, the total waste generation is projected to be 165 million tonnes by 2031 and 436 million tonnes by 2050. It is interesting to know that untapped waste has a potential to generate from 32,890 TPD of combustible waste, 439 MW of power which is enough to meet the power demand of a union territory like Pondicherry. This includes refuse-derived fuel (produced by shredding and dehydrating garbage) and 72 MW of electricity from bio-gas, as well as 5.4 million metric tonnes of compost annually that could support farming. Plastics, paper and glass constitute 17% of the recyclable waste and this is important because plastic waste, composed of high-calorific-value material, is a crucial fuel for solid waste-to-energy plants. The amount of waste that is generated, if collected and treated well, can be effectively used to generate energy. Globally, there are 2,200 waste-to-energy plants, of which European Union has 445, China has 150 and USA has 86 compared to just 8 in India. According to World Health Organisation 22 types of diseases can be prevented or controlled by improving solid waste management in India. Hence, people in India as well as local municipal bodies should change their casual attitude towards waste management. A more collective, structured and institutional approach from all stakeholders will be required to address this menace. Please check the data glitches in the first two paragraphs. If 62 million tonne is generated annually, 45 million tonne waste can’t be disposed off on a daily basis. Hope this generates some caution for your future articles. Best!